Lately I’ve been working with a number of small technology companies all of which have niche vertical solutions. The common denominator across each of the companies is that they all are struggling with how they should behave in order to scale to the next level of growth. As I work with each of these companies I’m going to document here the learning’s and try to find a framework that will provide others running similar companies value. The framework I’m starting with is one of a value chain. Here is how I am currently thinking about categorization and behavior in regards to where a company falls in the technology value chain. In today’s world of Enterprise Computing motivation and behavior of companies is different depending on where they sit on the Value Chain? Over the last 20 years I’ve had the opportunity to spend a great deal of time with many technology companies (Systems Integrators, ISV’s, OEM’s, Resellers, Training Providers and Hosting Providers) large and small and I’ve often wondered why many act as they do. One way that has helped me to understand these motivations was to put companies on a value chain. If chip manufacturers are on the bottom, right above the chips are the desktop and server hardware providers that use those chips… Right above the hardware providers you will find the platform providers like Microsoft with the operating system at the very bottom of that stack. 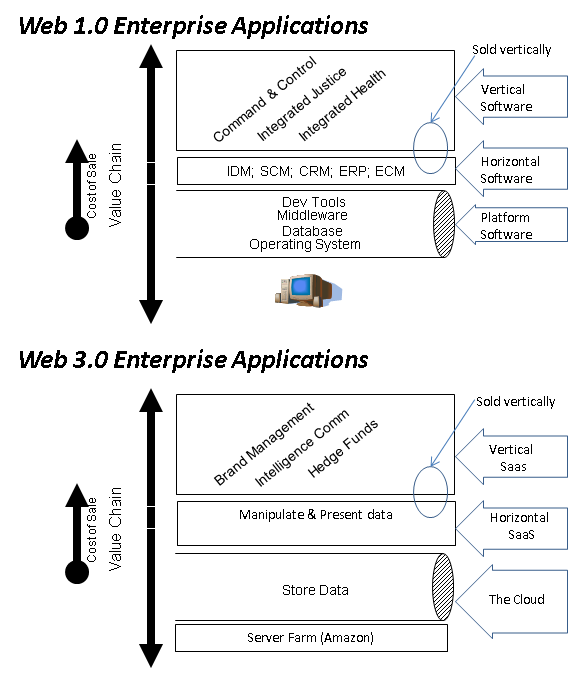 Then there is a hard line of demarcation on this value chain where IT value ends and business value begins. Unfortunately, the traditional platform product vendors, not at all unlike “dial-tone” in the telecommunications industry, are on the IT value side of that equation. Hence, most of their sales are targeted to the IT directors in the CIO’s office. Platform providers typically don’t produce much IP in this area, but they enable other companies to build on their platform. It is this very area where software as a services (SaaS) has had the largest impact. Hosted CRM, ERP, Content Management and other services have become a reality and customers have re-evaluated the way they think about investing in technology. Next on the value chain above the horizontal business rules are the vertical business rules. These are applications that run companies/agencies/department/institutions business. These vertical business rules are the solutions that customers invest in to solve their business problems. The companies that sell at this level of the value chain have a deep understanding of the business problems as well as business process reengineering. These companies are considered “Thought Leaders” and are companies such as Systems Integrators (examples: IBM Global Services, Northrop Grumman, Lockheed Martin and Accenture) and vertical ISVs (example: Curam Software). Customers want to “partner” with companies at this level that understand their business problems and provide “solutions;” any company not fitting this profile is just another “vendor” selling commodities. This can put the vendors below the vertical providers at a competitive disadvantage right from the beginning because some of the most important horizontal, platform and hardware decisions will be made by these vertical solution providers. Companies may indeed sell across multiple levels of this value chain but where they are positioned on it depends on where they make the majority of their revenues. For example, Microsoft still makes a majority of its revenues from Operating Systems and Office software. They do have horizontal intellectual property (IP) such as CRM and ERP and they also have vertical software such as HealthVault but Microsoft is primarily a platform IP provider. Another interesting element of the Enterprise Computing Value Chain is that the farther up the stack your company’s products are the more expense it takes to make a dollar. Comparing IBM, Lockheed Martin, SAP and Microsoft you will see that IBM and Lockheed Martin both make a majority of their revenue from solutions consulting at the vertical IP level, SAP is primarily a horizontal IP company, and Microsoft is a platform provider. IBM and Lockheed Martin are primarily people centric companies filled with thousands of consultants. Microsoft on the other hand primarily has software developers building the next generation platform software This if fundamentally why platform providers struggle–Microsoft’s customers would love to have them solve their business problems but their shareholders like the high profit margins and low expense. To make the transition to a company that solves business problems they would have to increase their consulting force, deal with longer sales cycles, focus on areas such as business process re-engineering and build vertical IP such as 911 solutions for state government and student information management systems for schools. You might say, revenue is revenue… but it’s not. Just look at the valuation of a software company vs. a services company in the marketplace. Services companies are valued at less than 1 times earnings where software companies are valued at 3 or more times earnings. The magic of software has always been you can build it once and sell it many times (an exponential growth model), but in the consulting world the main way to grow revenue is to add more warm bodies to the company (a very linear growth model). An interesting aspect of Horizontal IP is that it is sold vertically. Companies and government do not buy Identity Management or Customer Relationship Management (CRM) products per se. They do however buy solutions that require Identity Management and/or Customer Relationship Management engines. This is primarily why horizontal IP is a higher cost of sale (COS). The COS is not however as high as a vertical IP provider–why, because the engine is reusable on other applications the customer made need the engine for and they don’t have to buy it over and over again. Any account manager working for a company that has a CRM product will tell you that they don’t try to sell the value of the their CRM product to IT… They do however sell scenarios to government agencies for example to track bad guys, Army recruits, 311 calls and security clearances. The underlying CRM engine is just a tracking workflow development environment that comes along with the configuration code that will be built to track that specific scenario. There are many sources that say that for every dollar of software a customer buys they also spend greater than 10x that dollar in services. With vertical IP there is business process reengineering (BPR) and possibly vertical application development to configure the solution specifically for the client. There is also a need to implement some sort of “management” engine at the Horizontal IP level to support the Vertical IP. Then there is also a need for updated databases, middleware, operating systems and hardware. At all these levels there is a need for services. Let’s take one of the earlier examples. If an Intelligence agency were going to buy a solution to track security clearances they would need to hire people to understand the current process, make recommendations on the new process and train agencies on how to use the new solutions. They would also have to develop the vertical application on top of any Horizontal IP CRM engine. They would then have to hire people to install the Horizontal IP CRM engine. If the CRM engine requires new databases, operating systems then people may have to be brought in at the platform IP level to consult there as well. All in all, the premise is that the farther up the stack you go the more services that are required.